Our dogs, without a doubt, provide us an abundance of warmth and affection. But as a pet owner, I also have to admit that dogs are decidedly challenged when it comes to boundaries. Although they can be trained to correct these behaviors, our patience may run thin during the process. Thankfully, this nuisance can now be avoided with the use of some of the best dog gates. And if you happen to be looking for them, you’ve stumbled on the right page! Whether you’re trying to teach your dogs the art of respect for boundaries or you’re merely protective of them, a dog gate is ultimately one of the only few alternatives that work. Right after this, I’ll be unveiling the best dog gates that are also well-reviewed and much-loved by their users now. Later on, we’ll look into the things to consider when finally buying one along with the process on how to choose a dog gate.So without further dawdling, let’s get right into our top picks! Function meets flexibility. And when these two combine, the possibilities are just endless. The Deluxe Décor Gate is exceedingly ideal for those places with extra-wide openings like the bottom of your stairs and the ones situated between your rooms. This function is made possible with the item’s highly durable, metal construction that is finished with matte bronze — a choice of hue that should complement any home design. Your dogs’ social moments won’t be interrupted by the time you decide to open this gate as it features a stay-open offering. Now, if you’re gunning for another width from your gate, this can be remedied by just opting for the 6-Bar Extension which can add 15 inches to your gate. If you own a Dachshund or a Yorkie and are fretting over instances in which some of your puppies could get through the gate, then the Richell Wood Freestanding Pet Gate should work for you. It unmistakable low height should allow you to step over with easy access simply. The much-needed side-panels are also included which should veer the product away from wobbling and tipping over. Also, the item comes with rubber feet which easily render it from not sliding on hard floor surfaces. And if you’re into woody aesthetics, consider this offering as a godsend! 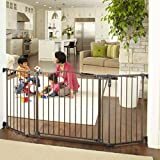 Its very feature to expand to a 192-inch wall-mounted gate and an 8-panel configurable play yard would let you know that this item is ideal for wide areas that need blocking from your dogs or puppies or combined. Meanwhile, its otherwise convenient walk-through design is specially engineered with a safety locking feature that should come in handy for those with smart dogs. Its all-steel durable aesthetics is only made more modern with its easy-to-install set-up and storage. Flexible as advertised, this second Regalo offering can indeed be used too as a fire place guard, a stair way guard, and if you must, a Christmas tree barrier. Whenever your life becomes a little more hectic than usual, and you have less time to segregate your pet from another, this Regalo product should be exceptionally ideal for you. This rings true as its function is superbly multi-faceted: it can be used in doorways, hallways, staircases, and even at the top of your stairs! It can fit openings that range from 29-39 inches. The additional extensions (sold separately) allows you to customize the gate’s width — enabling you to meet opening size up to 60-inches. Regalo’s contender is also pressure-mounted and includes lever style handle with safety lock functionality that boasts a one-touch release. This should make all the moms satisfied as this can be utilized not only for their pets but ultimately for their children, too! A small pass-thru space isn’t just sufficient for most. In fact, most users would prefer extra-wide openings — a hallmark Carlson Extra-Wide Walk-Through Pet Gate especially features. The convenient, chew-proof gate is also made of steel that comes with a pressure-mount system. It has two extensions that should cover your house for a good 29 to 44 inches. Meanwhile, the product’s walk-through design is equipped with a one-touch release handle that enables you to pass through it while carrying stuff. On the other hand, its 10-by-7-inch pet door should be convenient enough for your small pets to get a passage to. Add-ons include four threaded spindle rods, four adjustable hand wheels, four wall cups, four screws, and 6-inch & 4-inch extensions. Not ideal for dogs that weigh less than 15 lbs. The last thing you’d want to happen is causing your dog an injury while trying to ward them off from experiencing this. One of the things that you need to consider in respect to this is the width of the space between the spindles. Ensure that each spindle is not too large for dogs’ leg or head as this may bring them some unnecessary boo-boos.The usual spacing you have to look and ask for should be about 1 ¾ which is already deemed as a safe distance. Beyond that measure, things could get a little problematic between you and your dogs. When you bend or step over numerous times on top of your dog’s gate, chances are you won’t only be experiencing some pain on your back, but you’ll realize how much of a time-killer it is when you do it. Rather than doing this cycle repeatedly, you can opt for a gate that is equipped with a door that opens and closes. Another convenient feature you should be gunning for is folding panels. Convenience aside, this will be advantageous for owners who block openings that are wider than their doorways. Meanwhile, the foldable design will also allow its users to collapse and carry it along with them while they travel. If you’re just trying to block your puppies from objects such as your children’s toys or plants, then step-over dog dates should work for you. On the other hand, this feature is not advisable for those who own large dogs. As much as possible, go for dog gates that only require little to no assembly at all. As a dog gate user for years, gates that stood the test of time in our household are those that are both easy and comfortable to use. As such, dog gates that are a little too complicated to use are often disregarded just days after their initial use. These features should depend on the dogs that you own. Make certain that you know the size or breed of your dogs as these are crucial when you get to buy them at the store. Disclose this information to the seller, and they should be able to tell you which gate is appropriate for your dogs relative to their height and size. Apart from the features, the most significant factor you need to focus on is choosing just about the right gate for your dogs. In this regard, it is but important to highlight your “purpose” for owning a dog gate in the first place. Once you’re able to determine which purpose is this, then ascertaining the best type of gate should be a breeze. Further to our buying guide is the different dog gates that are available in the market now — which can ultimately make you choose the right one for your puppies or dogs. Knowing these can certainly make you a pro in clinching the best product for your purpose. These are the ones you should look for when you want to keep your dogs in place on your patio or yard. As this will be placed outside, choose a product that features a strong, water-resistant material. As for someone who lives in an apartment, I’d strongly recommend that your dog gate should be able to blend with your décor accordingly — may it be made of wood, iron, or even plastic, there are now a variety of options for these. Also, it’s imperative that you choose those that can be set up and removed comfortably and easily. If you own a large dog that often knocks your gate down either with its will or by accident, it’s crucial that you for a gate that can be installed right into the wall for more strength. On the other hand, if your dog is calm, a tall, freestanding dog gate should suffice. Dog gates are not only designed to block a particular doorway. There’ll be times when you need to prevent your pet from home spaces which house some of your most prize items such as your living room or dining area. The dog gate that you must choose should have multiple panels, allowing you configure the panels relative to the size of the location. If you carry your dog a lot while you’re traveling for a vacation or a sleepover, the choose dog gates that are portable. Also, this dog gate should have a feature that allows you to set it up in your temporary residence. Ensure that this dog gate is both well-ventilated and roomier enough for your dog to lounge around. This type of dog gate is especially suitable for those who intend to block a certain area when there are guests that are coming over for a visit. This dog gate should not only be attractive enough but should also be easy to assemble and take down at the same time. In this case, any free standing pet or dog gate should address this need. There comes a time when we need to segregate our large and smaller pets from one another. This should work for those who own a large dog and a cat or the former and also a smaller dog. A dog gate with a small pass-thru gate should be able to allow both pets to have their own time as a result. 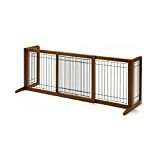 As such, this gate should also be tall and sturdy enough for it not to be toppled down easily by your larger pet. We can also keep our dogs safely from injuring themselves from a fall when they use the stairs or attempt to loiter beyond our porches. For dog gates right on your stairs, choose a gate that can be installed right into the wall; it should also be sturdy and feature a walk-thru and a locking gate. For dog gates to be installed on your deck or porches: that dog door should be able to withstand outdoor elements like rain and dust. Moreover, this gate should also have a latch shut so your pet can’t turn it open when it sees something on the other side. For those of you who’d like to make their own dog gate, you can watch this video. It’s been a tough competition among our contenders with their varied, reliable features yet distinctive functionalities. And if you will, all of our entries are a standout! But if one must choose which of them trumps a little slightly, then it has to be the Regalo Easy Step Walk Through Gate. Its extreme flexibility to virtually all the spaces in your place is already a cherry on top; and once you include its coverage and more than dependable offerings, one must say that this is a steal. Was the article helpful enough to aid you in your decision in regards to finally choosing your dog gate? Do you have more tips to share about our buying guide or installation, perhaps? If you do, please feel free to sound them off in the comment section below. Until then, happy shopping!